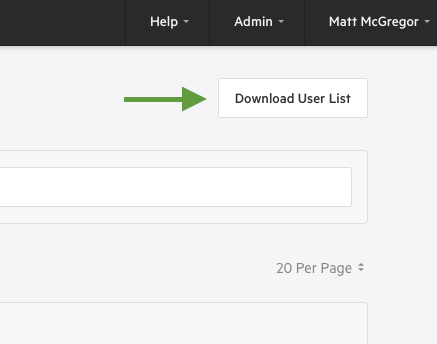 Learn how to download a CSV of all users on your Data Service. This will include all users who have signed in to your site using their Koordinates ID. Your Data Service will then email you download link. Your CSV will include the following fields for each user. In parentheses, we've shown how these fields will appear at the head of each column in your CSV. This will be the users first and last names, as provided during registration. The email address provided by the user during registration. This is the date and time at which they joined as a user of your Data Service. This field will list 'Paid' against any users with Paid Seats for your Data Service. This will be the country listed by the user when they signed up for their Koordinates ID. Administrators for your site will be listed as TRUE. Users that have been suspended from using your site will be listed as TRUE. Users that have opted in to receiving communications from your Data Service are listed as TRUE. For all activity after 18 July 2018, this will provide the date and time the user was last active on your Data Service. If a user has not been active on your Data Service since 18 July 2018, this will be the date and time at which the user last logged in.